Before I start discussing today's Royal Parks Half Marathon, I would like to share this observation recently offered by the marathon guru Hal Higdon: "Your friends don't want to hear your time, or whether you set a Personal Record in your race. All they care about is that you finished." To those to whom this applies, I assure you that I did finish. You are welcome to keep reading, but should feel yourselves under no obligation to do so. Yesterday was spent resting, running a few simple errands, and trying out some recipes from Scott Jurek's book 'Eat and Run.' For those who don't know who Scott is, he is one of the top ultra-marathoners in the world. The sort of guy who wins 100 mile races while breaking course records. He also happens to be a vegan. So in his book he offers some of his recipes. 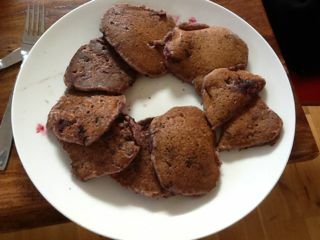 Breakfast yesterday was Eight Grain Pancakes with Berries. 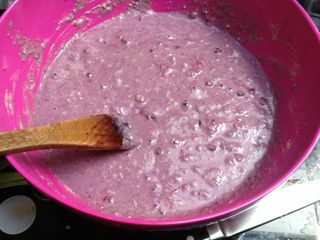 We used a mix of berries which gave the batter and the finished product a distinct purple tint. They were also delicious and full of nutritious things. Dinner last night was Lentil-Mushroom Burgers. Then I got myself all organized for the morning and headed to bed in plenty of time for a full eight hours sleep. Except that about 1:00 in the morning the fire alarm in our building (which is prone to going off for no apparent reason) went off. Once woken from a sound sleep it usually takes a while for me to get back to sleeping. Suzanne ended up making me some sleepytime tea and that finally did the trick. Anyway, when the day finally dawned, clear and chilly, I was a little short on sleep. Nevertheless it was time to get dressed, have my usual cereal with yogurt and seeds (including this week's addition: chia seeds), some juice, and an espresso. Then off to the races! After some conversation with Barbara, my coach/trainer, we had come up with an aggressive race strategy. The plan: try to stick with the people pacing for 1:30 as long as I could, and see how things go. 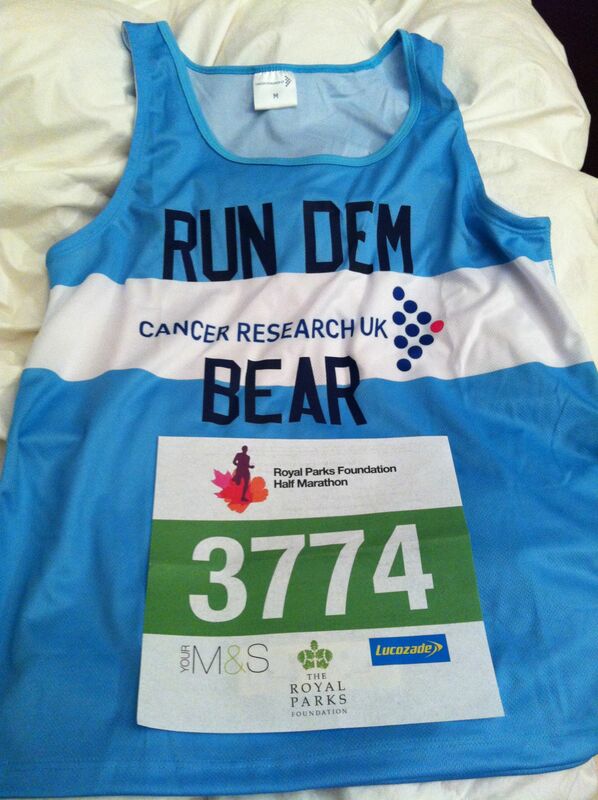 I had originally proposed starting out at the 1:40 pace and seeing if I was up for speeding up later in the race. So this was definitely a bit outside my comfort zone. And I knew that there was a definite chance that starting out too aggressively could very well cost me time at the back end. It was pretty clear after a few hundred metres that I was not going to be able to stay with the 1:30 crew, but I was able to keep them in sight for a fair while. It was really great to be running through familiar streets as the race went by Hyde Park Corner (where I got my first shout out from the Run Dem Crew cheering section a.k.a. Cheer Dem Crew, and a little bit later from Suzanne), and then down towards Buckingham Palace and on to Westminster Bridge. This whole first part of the race was just magical. I had great thoughts of all the people who were supporting me (either in person at the race and/or through donations to my fundraising for Cancer Research UK), plus I really felt like I was on my home turf. Run Dem Crew runs much of this part of the route every couple of weeks, so I could just cruise, enjoy my pace, and admire the bright sunshine. This good feeling and cruising took me through the first split with a 5k time of 22:11 which was a new personal best. The last time I had gotten anywhere near this time I had hit 5k and then stood gasping for several minutes, so this is a great sign of progress! The course then doubles back shortly after Waterloo bridge, cuts back along the north edge of St. James Park, back through Green Park, and then into Hyde Park. At this point I got another big shout out from Cheer Dem Crew (who were fantastic today!). Shortly afterwards I hit the 10k mark with a time of 45:52, another personal best! At this point things got a little more complicated. First off, the course through Hyde Park is quite twisty, plus there were some odd terrain changes, and there were some hills. But I kept putting in stretches where I was focused on using all of the technique I have been taught: knees up and driving forward, heels kicked up, etc. So even though this stretch was my slowest 5K of the course I still managed to maintain a respectable pace, although slower than I would have liked. We finally crossed over to the west side of the park, picked up some downhills, and headed for the home stretch. And this was where I had my toughest part of the race. I was still running fairly strong through kilometer 21, but then the last 900 metres I just ran out of gas. That stretch seemed to take forever. It certainly didn't help that there was a bit of very spongy terrain which sapped a bit of energy out of my legs, but even back on hard, flat, roadway I was struggling, From 800 metres to go to 400 metres to go I felt like I had nothing left to give. Then the people pacing for 1:40 caught up with me and they were yelling at people to start sprinting to make 1:40. I gave it my all, and almost made it, but couldn't quite keep the spring up to the very end. 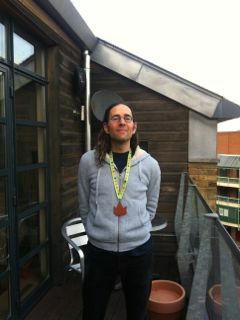 Nevertheless I finished with a (you guessed it) Personal Best time of 1:40:14. Chuffed? I would say so. I feel very good about this. I have no doubt that if I had taken a more conservative approach to the start of the race I would have easily finished with a sub-1:40 time. But there's always another race for that! One of the best parts of this race was definitely feeling like I had so many friends and relatives behind me. When things got tough I thought about the toughness I have seen people showing in their battles with cancer, and this helped me dig deeper into my reserves to keep pushing forward. I also had lots of stretches where I was able to just think about how showered with love and support I have felt through my entire race prep and fundraising process. Big big thanks to all of you who have been part of this journey! This page contains a single entry by Daniel Maskit published on October 7, 2012 3:39 PM. The Science of Training was the previous entry in this blog. Amsterdamage is the next entry in this blog.